My thoughts about '2001: A Space Odyssey' can almost be summed up by a line from Harmony Korine's 'Spring Breakers' in which James Franco's character proclaims about his luxurious bed that ''it isn't a bed, it's an art piece''. Substitute ‘‘film’’ in for ‘‘bed’’ and you have the most straight forward possible description of Kubrick's space epic. But the film, and it's one of kind creator, are anything but straight forward. After the discovery of strange monolith buried under the lunar surface, a space team goes on a mission to Jupiter investigate the monolith, with the help of HAL 9000. There may be no other picture in history that completely represents film as an art form, quite like '2001'. Every single frame of the film seems like an individual piece of art, and the film as a whole would not be out of place playing on an endless loop at any prestigious art museum. In addition to being the most visually arresting cinematic experience available. '2001' is also a triumph in the story telling. Kubrick's use of minimalism and lack of a coherent narrative, instantly make ‘2001’ a unique piece of work, but its scope and execution make it immortal. Only a filmmaker as ambitious as Kubrick could even attempt to orchestrate a film on the scale of '2001. It's almost a work of a mad genius, beginning a film with a 20+ minute stretch of no dialogue (sans the screaming of apes and growl of leopards) and apes seemingly fighting for territory and discovering an artificial monolith, would have had to be a courageous move for a filmmaker in 1968. One of the infinite things I respect about Kubrick is that he never took his audiences for granted, he didn’t usually waste time on introductions and had the trust in audiences to be prepared for the journey he is about to take them, ‘2001’ is exhibit A when it comes to this. The lack of a grounded narrative here may alienated some viewers who are used to having Directors walk them through films, but if they simply dismiss the film at 15 minutes in and refer to what they have seen as boring and nonsensical, then they are doing themselves the displeasure of missing out on one of cinemas greatest journeys. Like he did with ‘The Shining’ 12 years later, ‘2001’ sees Kubrick create a labyrinth of mystery and unanswered questions. As his co-writer and author of the source material, Arthur C. Clarke once said of the film that ‘’If you understand 2001: A Space Odyssey completely, we failed’’ going by the way in which audiences have been baffled by and absorbed by interpretations in the decades after its release, the film was an almighty success by Kubrick and Clarke’s criteria. I’m a huge fan of when great films leave themselves open for interpretation, It’s such a great attribute for a film to have and it transcends being used simply for entertainment value, ‘2001’ is a prime example of getting this aspect utterly right. This film that you have the urge to watch over and over again in order to form an opinion of your own. Kubrick being Kubrick most likely has dozens of underlining themes hidden throughout the film that people have yet to tap into. As I, and everyone else, have already alluded to, ‘2001’ is beautiful. There has been almost an infinite amount of visually beautiful films, the likes of ‘Lawrence of Arabia’, ‘Days of Heaven’ and even Kubrick’s own ‘Barry Lyndon’, but in my opinion, ‘2001’ truly trumps them all as the most awe-inspiring looking film in the history of cinema. So many shots throughout the film are incredibly innovative, scenes like the famous million year spanning transition shot in the films prologue with the ape throwing the bone in the air and it transitioning to a space shuttle, the air hostess using her grip boots to ascend to the roof of the ship, and of course Dave’s trip at the films climax. These three scenes are some of the most iconic you may ever see, and they’re simply 3 of the many throughout the film. The incredible Visual effects (for which Kubrick received his only Oscar) are as incredible as almost anything you will see from Science Fiction films today. Dave’s trip at the end of the film is the definition of mind blowing. 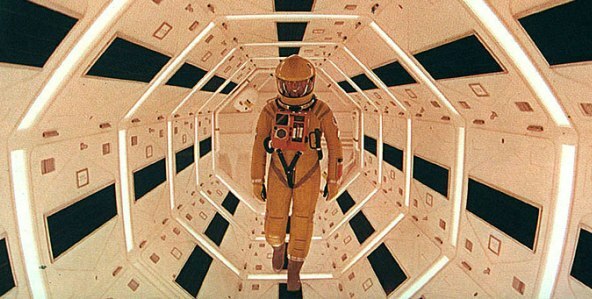 ‘2001: A Space Odyssey’ may be one of the most difficult films to critique. The film is almost intimidating in its perfection. There is also no way which someone like I can do this film justice, its cinema at its most artistic and awe-inspiring. A true iconic masterpiece, whose influence is still being felt to this very day.